Procedural success was achieved in 84.4 %, 76.9 % and 70.2 % of patients with RC 2-3, RC 4-5 and RC 6 respectively. Procedural complications were rare (0.8 % to 2.0 %) but resulted in post-procedural complication in all RCs, and 78 % of RC 6 were discharged to home. 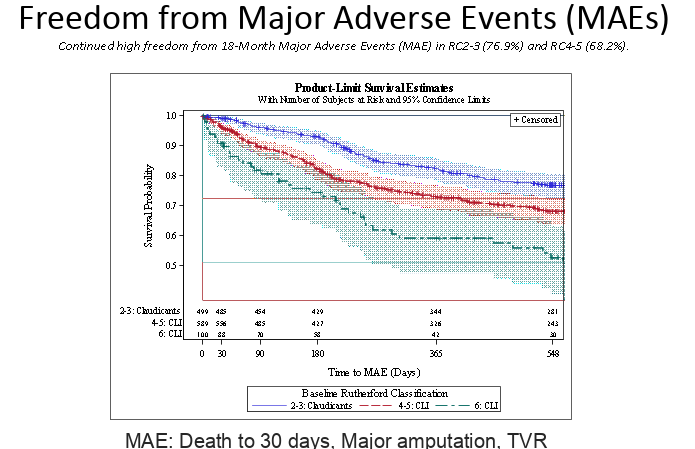 At 18 months, high rates of freedom from major adverse events (MAEs, defined as death to 30 days, major amputation or target vessel revascularisation) were reported (76.9 % in RC 2-3, 68.2 % in RC 4-5 and 52.8 % in RC 6). However, even when considering advanced disease in RC 6, MAEs were not driven by major amputation (81.7 %). Sub-analysis of those undergoing orbital atherectomy showed high freedom from MAE (80.9 % in RC 2-3 %, 70.4 % in RC 4-5, 63.9 % in RC 6) and amputation (100 % in RC 2-3 %, 95.3 % in RC 4-5 and 91.3 % in RC 6) in all groups. Patients classified RC 4-5 and RC 6 showed continued improvement from 30 days to 12 months, while RC 2-3 maintained 30-day improvement at 12 months. Quality of life assessed using VascuQoL improved significantly in all subdomains from baseline to 18 months in all RC’s. Patients in RC 4-5 and RC 6 showed significant improvement in the mean number of wounds from baseline to 12 months. Dr Gray ended his presentation by stating that LIBERTY 360 represents as close to a real-world experience with various endovascular strategies across RC’s. Many of these would never be included in a clinical trial, in particular RC 6 patients. The results of this novel allcomers PAD study continue to suggest that PVI is a reasonable treatment option for RC 2-3 and RC 4-5. Primary amputation may not be necessary in RC 6, since PVI can be successful in this patient population, as shown by high freedom from major amputation (81.7 %) and improvement in quality of life and RC.